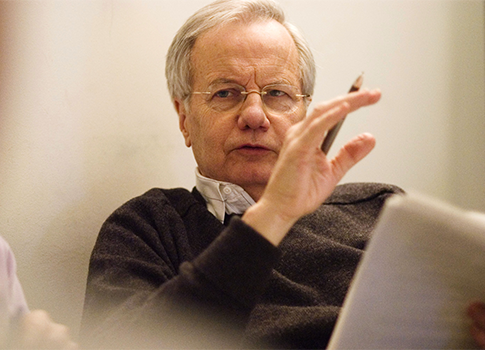 Veteran journalist Bill Moyers heads a foundation that has provided more than $1 million in grants to liberal groups, which then provide guests for Moyers’ television show—a potential conflict of interest, according to one watchdog group. The conservative Media Research Center (MRC) reported Monday that the Schumann Center for Media and Democracy, of which Moyers is president, has given more than $1.3 million to a number of tax-exempt nonprofits spearheading the campaign against the American Legislative Exchange Council (ALEC). "Experts" from these nonprofit organizations then appear on Bill Moyers’ show, "Moyers & Company." This week’s "Moyers & Company" episode, "United States of ALEC," will focus exclusively on the conservative organization that sponsors free-market-oriented model legislation in state legislatures; the episode appears to feature Lisa Graves, executive director of the Center for Media and Democracy, or CMD, which is not to be confused with the Schumann Center. The MRC alleges these grants ethically compromise Moyers’ recent reporting on the influential free-market organization. "The Society of Professional Journalists, of which I am proudly a member, warns against conflicts of interest real or perceived," MRC vice president of business & culture Dan Gainor said in an interview with the Washington Free Beacon. "In other words, it doesn’t matter whether he thinks there's a conflict. It matters whether ordinary people thinks there is, and of course they would." Gainor said the issue is "disturbing" because "we have a guy who goes around as the dean of journalism—a respected journalism icon—helping fund these groups trying to silence conservative voices." The Schumann Center was also listed as a foundation donor in Common Cause's 2011 annual report, although the amount of money given was unspecified. As reported by the Free Beacon, these groups have been extensively involved in the campaign against ALEC. CMD runs "ALEC Exposed," an anti-ALEC website frequently cited by ALEC opponents. The group also employs journalists with questionable backgrounds. Common Cause has filed IRS whistleblower complaints against ALEC. People for the American Way executives have attended public forums about defeating ALEC with CMD and Common Cause. Moyers’ website and TV episodes have focused heavily on campaign finance reform and the influence of money in politics. In a "Moyers & Company" May 11 episode, "Fight for Fair Play on TV and Taxes," Moyers spoke about "the unshakable grip of the very rich on their mercenaries on both our political parties." Moyers’ website also featured a column by Suzanne Merkelson, the associate web editor for the campaign finance reform organization United Republic. Nick Penniman, United Republic’s president, was formerly the Washington, D.C., director of the Schumann Center. As reported by the Free Beacon, United Republic at first refused to disclose its donors despite promises to do so, only to release an incomplete list months later. All of the groups listed above, with the exception of Common Cause, fail to disclose the identities of their individual donors. They operate the same way as the "dark" 501(c)(4) nonprofits they accuse of corrupting politics. Moyers’ ties to the Schumann Center previously have drawn criticism from the MRC. In 2009, MRC president Brent Bozell knocked Moyers for featuring a senior fellow from the CMD without disclosing the financial ties between the group and the Schumann Center. In a response to Bozell’s criticism, PBS Ombudsman Michael Getler asked Moyers about the perceived conflict of interest. "In no situation where a journalist or journalistic organization has received funding from the Schumann Center have I exerted any influence over content," Moyers said. "So, the short answer to your question is: No, I do not consider it a conflict of interest to be a journalist while helping other journalists do their work as well." However, as Getler noted, "working journalists usually do not also run foundations that provide financial support to other organizations that, in turn, sometimes provide guests for your own program, or other programs or projects and issues you care about, and sometimes the connections are not made clear on the air." MRC's Gainor said that, even if Moyers’ actions do not explicitly violate journalistic ethics, it is vital to examine the connections between the Schumann Center and Moyers’ coverage. "The real point is, ultimately the media doesn’t follow the connections, so we have to," Gainor said. "Moyers & Company" did not return requests for comment. This entry was posted in Politics and tagged ALEC, Democratic Donors, Media, PBS. Bookmark the permalink.